Everyone on earth has become a primate overnight! Thankfully as the Super Friends are on the Satellite, they are safe... for now. The emergency alarm fired up and a message from King Solovar begged them to come to Gorilla City. 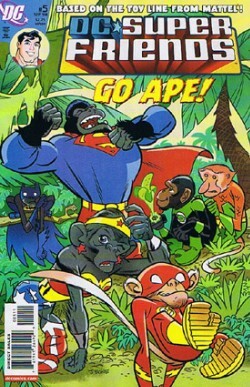 Though the Super Friends know as soon as they arrive they'll become apes too they have no choice. True to form they change as soon as they arrive... the gorillas have changed in the opposite way, it's now Human City! These newly transformed humans attempt to capture the Super Friends until Wonder... chimp is able to trap them in her lasso. Something�screwy�is going one, apes are now human and humans are apes? Who could be behind it Diana asked... Gorilla Grodd! A wretched old man calls for help and Flash brings him to safety, the man reveals there is a machine responsible for everything and it is in the shielded lab... problem is only Gorilla Grodd can get in to switch it off... not him... Human Grodd! Grodd reveals it was originally a revenge plot but the device was so strong it affected the entire planet - not just Gorilla City. Flash�realizes�something in a rare moment of intelligence - when the forcefield is on only Grodd as an ape can enter or exit but one other thing can get in - AIR! Using his tail as a whirlwind creator he uses the air inside to create a vacuum pulling the machine outside! Into the arms of Super ape and Green monkey who quickly set it down for Grodd to deactivate. He does so much more comfortable in his own skin and everyone else in theirs too! Green Lantern uses his ring to prevent Grodd from using his mental powers and imprisons him! XOLI ISDO, INO PEVOY CYSOXRP KYO MKEQNI SX INO IOYYSHZO IYKVP BC INO UOW! Super Friends�door hanger, The Flash fact file, Super Speed word game, What Would You Do? Superfriend lesson. Story - 5: Finally a story that is fun and interesting and not soaked in�Disney-esque�life lessons. Despite the fact this could have been a JLU issue but it was a fun book this month. Art - 4: The designs for the Super Friends as apes are brilliant, I bet they'll be more than a match for the junior JL in Superman/Batman! I like the fact the they're now experimenting with the book and its very different look. Unfortunately without the apes this would be a 3, they deserved the extra point! Cover Art - 5: Apesome! Finally the book has a cover that says 'BUY ME!' The covers now looks less like a toy advert and more like a fun book!